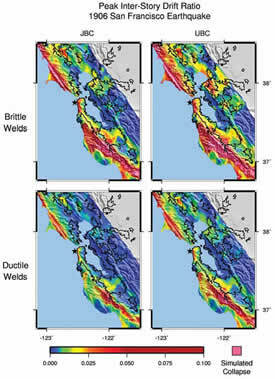 Simulated maximum shear deformations of hypothetical 20-story steel buildings to ground motion simulations of the M 7.8 1906 San Francisco earthquake (Olsen, Aagaard, and Heaton, 2008, BSSA). Nonlinear finite element simulations of buildings are conducted at each grid point on the surface of 3-dimensionalo finite element simulation of the earthquake. Plots on the left are for buildings that meet the 1992 Japanese building code and plots on the right are for buildings that meet the 1994 Unified Building Code (Zone 4). Buildings on the top are assumed to have brittle welds (typical of pre-1994 construction) and buildings on the bottom have ductile welds. Red colors indicate sever building damage and pink colors indicate that simulated collapse occurred. Research in engineering seismology is a joint effort between the Seismological Laboratory within the Division of Geological & Planetary Sciences, and the Earthquake Engineering Research Laboratory within the Division of Engineering and Applied Science. Understanding the ground motions in large earthquakes and their effects on buildings is a central theme. Caltech is also a leader in developing real-time alerting systems to provide organizations (e.g. utilities, railroads, Caltrans) with tools that allow them to respond effectively during an earthquake crisis. In addition, Caltech researchers are developing innovative new networking technologies to continuously record the dynamic vibrations of buildings. Research in engineering seismology is a joint effort between the Division of Geological & Planetary Sciences, Seismological Laboratory and the Earthquake Engineering Research Laboratory within the Division of Engineering and Applied Science. Below is list of scientist doing research in this area.